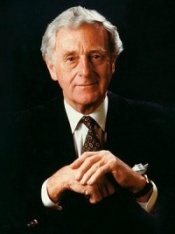 JOHN SEIGENTHALER of Nashville died here today, local and national media are reporting. The advisor to more of America's leaders, the mentor and role model for more of the world's citizens and journalists than he would ever have acknowledged, passed away at home earlier today, at 86. He was born John Lawrence Seigenthaler Jr., in Nashville, July 27, 1927. Our deepest sympathy to his beloved Dolores Watson Seigenthaler, with whom he was married in 1955, and to their son John Michael Seigenthaler, also a highly respected newsman, and their families. Mr. Seigenthaler was husband, father, trusted compass, witness of the human spirit, advocate and protector of those in need, and an American journalist. He was devoted to his family, his fellows, the First Amendment and Freedom, itself. He was a rare constant in the lives of many. Mr. Seigenthaler's life -- and the compassion, courage and conviction woven into it -- will be more ably recounted by The Tennessean, which he led for decades, and by others. The Tennessean's initial story is here. Funeral arrangements for Sunday-Monday, July 13-14, are reported here. [1:21 p.m.] Mayor Karl Dean this afternoon released this statement on Mr. Seigenthaler's life and passing: “Today we lost an iconic figure in Nashville's history -- a man who stood for inclusiveness long before it was synonymous with our city's culture. As a journalist, John did much more than bear witness to political and community affairs; he helped shape Nashville's story, laying much of the groundwork for us to become the great city we are today. Personally, he has been an advisor and a friend. Our city will feel his absence. Anne and I extend our deepest condolences to Dolores, John Michael, Kerry and Jack, the apple of John’s eye."